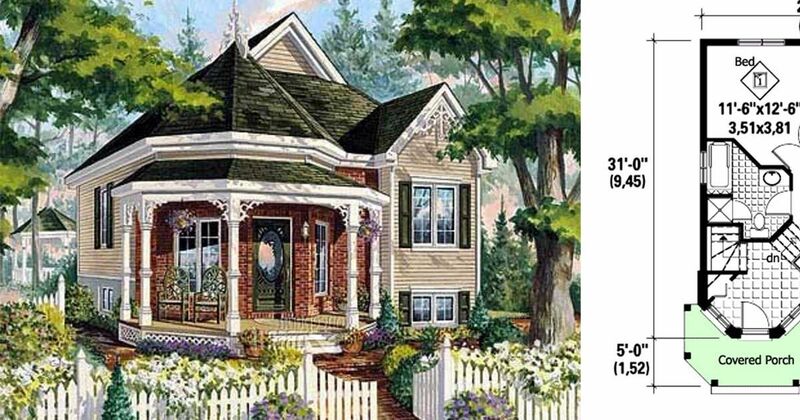 Most people can't help but love traditional Victorian homes, regardless of how big or small they are. However, this style of home is especially lovely when all its charm is shrunk down to fit in a pint-sized package like the ones in this article! If you're looking for a tiny home with plenty of old-fashioned curb appeal, look no further than the houses below. Every single one of them would be a great addition to any neighborhood, whether it's in a historical district or not! 1. 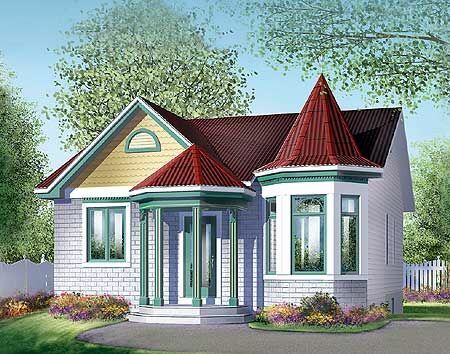 Compact family home with interesting roofline from Houseplans. 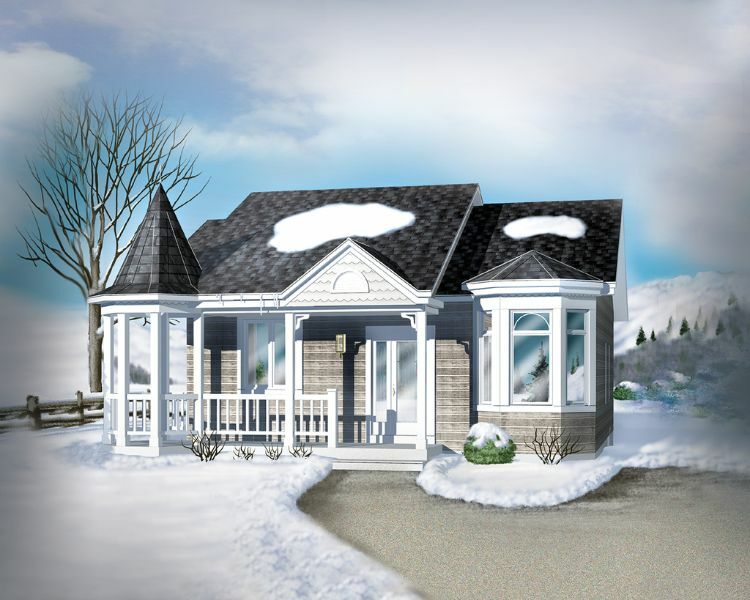 This two-bedroom design from Houseplans comes in at 906 square feet (84 square meters), and it boasts a charming exterior with a columned front porch and a bow window on the left-hand side. The front door opens into a small foyer, and the living room is off to the left. The dining room is right behind the living room, and a tiny but efficient kitchen is squeezed into the back left corner of the home. A bathroom with both a tub and a shower is right next to the kitchen, and two bedrooms are on the right side of the home behind the foyer. 2. 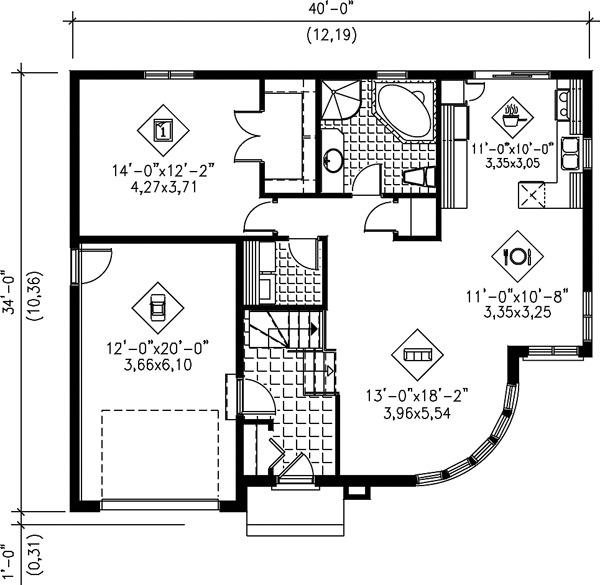 Two bedroom design from Family Home Plans. 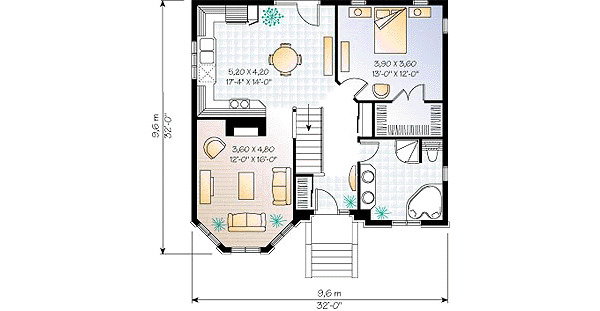 Measuring 780 square feet (72 square meters), this design from Family Home Plans would be well-suited to a small family. A small tiled area with a coat closet greets anyone who enters the home, and the living room is directly behind it. The dining room and the kitchen can be found in the back left corner. 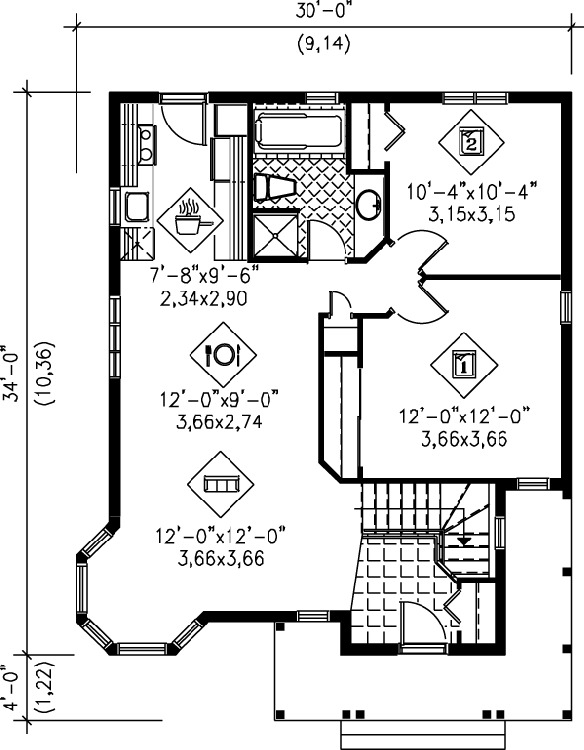 Two bedrooms are on the right-hand side of the home; they share access to a bathroom with a tub. 3. 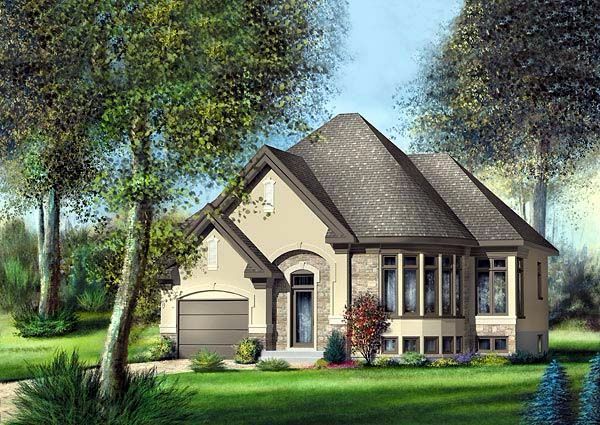 Elegant home with plenty of curb appeal from Architectural Designs. This gorgeous home from Architectural Designs measures 708 square feet (66 square meters). The front door is located under a small front porch, and it opens into a formal foyer with a coat closet. A small flight of stairs leads up into the living room, behind which are the dining room and the kitchen. The large master bedroom is in the back left corner of the house, and a bathroom with both a tub and a shower can be found between the foyer and the bedroom. 4. 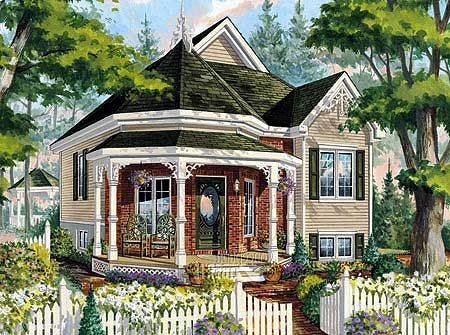 Charming design with large front porch from Houseplans. 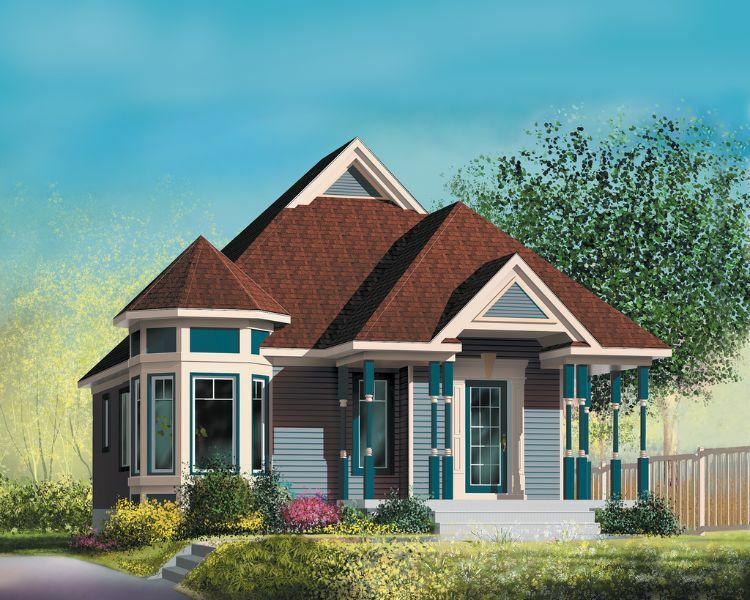 Coming in at 940 square feet (87 square meters), this design from Houseplans features a charming front porch. There is a coat closet just inside the front door, and the living room is off to the right. The kitchen and dining room are directly behind the living room; the kitchen features a large island with an eating bar. In the back left corner, the uniquely-shaped bathroom can be accessed through a small hallway. The master bedroom in the front left corner of the home has a unique shape as well, and it features a walk-in closet. 5. Perfect family home from Architectural Designs. 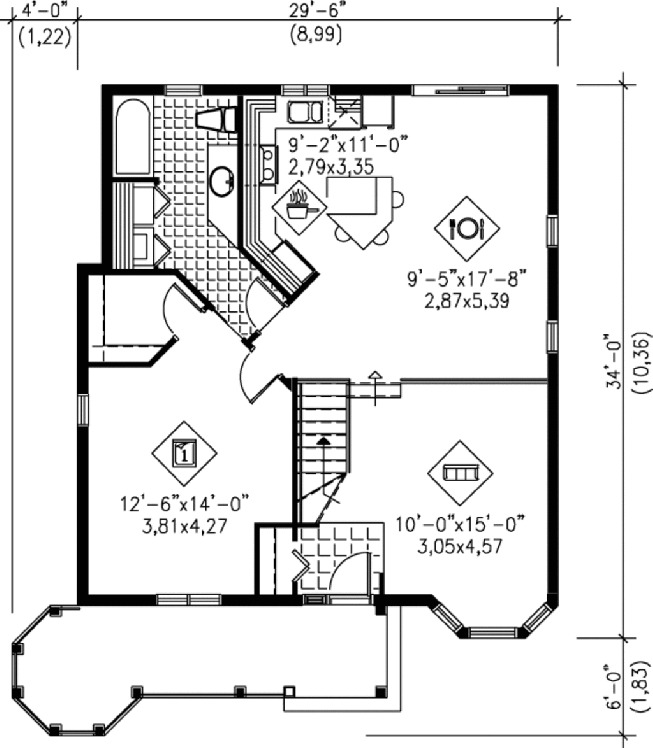 This floor plan from Architectural Designs comes in at 926 square feet (86 square meters), and it has a unique exterior that would add interest to any neighborhood. Once inside the front door, the living room is directly off to the left. A bay window floods the room with natural light, and a step at the back of the room leads to the dining room and a kitchen with a walk-in pantry. 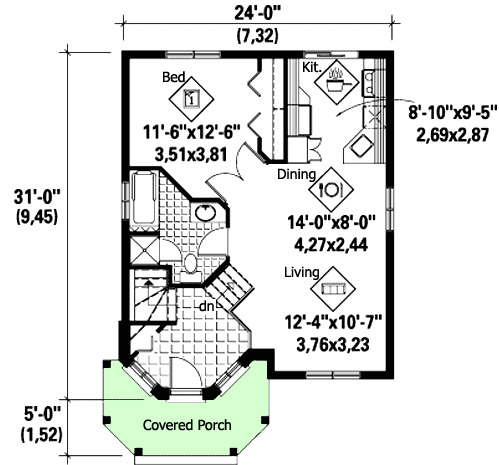 Two bedrooms and a bathroom with a tub can be found on the left-hand side of the home. 6. 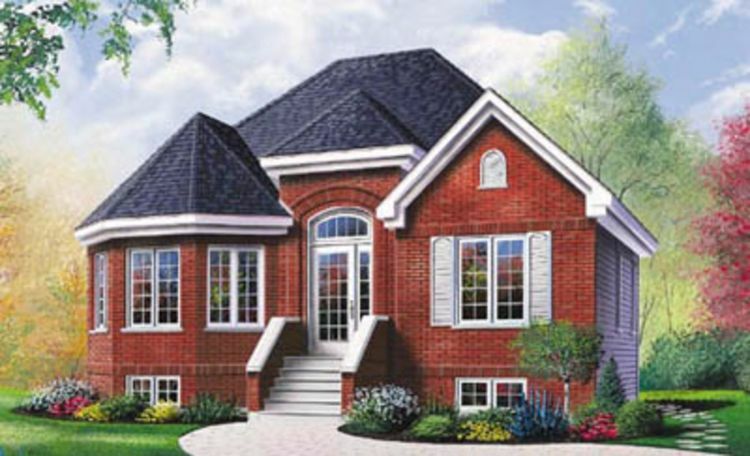 Brick home with bay window from Houseplans. At 940 square feet (87 square meters), this floor plan Houseplans features several luxurious touches like a spacious walk-in closet and a large soaker tub in the bathroom. A small flight of stairs leads up to the front door, which opens into an entry hall with a coat closet. The bathroom is immediately off to the right, and you can continue straight ahead to find the master bedroom. The main living space is on the left side of the home; the living room is set in a bay window at the front while the eat-in kitchen can be found at the back. 7. 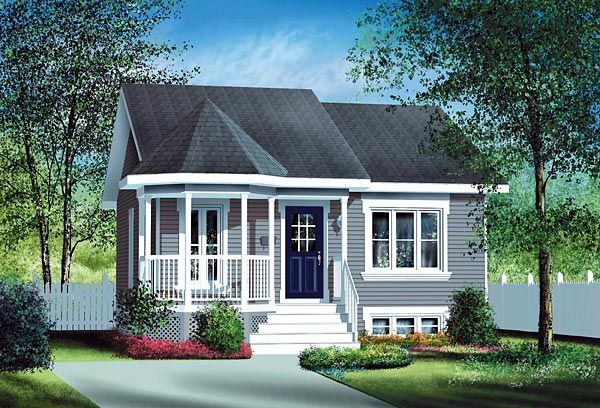 One bedroom home with single garage from Family Home Plans. 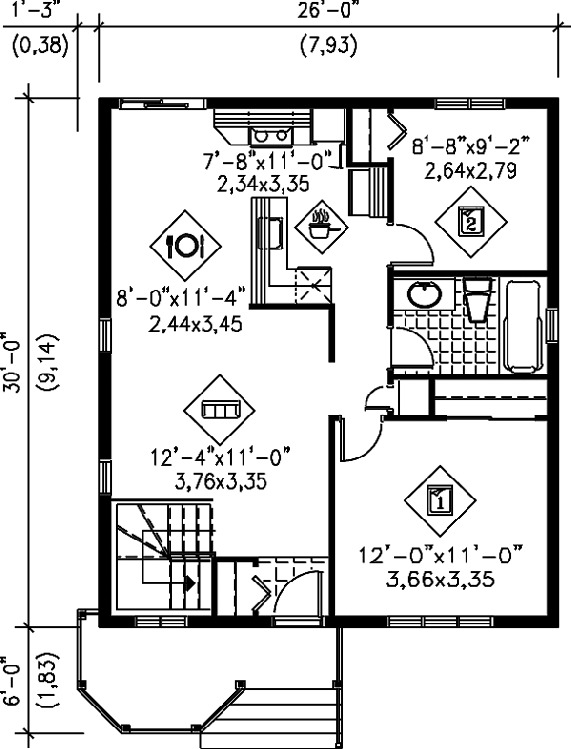 Measuring 968 square feet (90 square meters), this one bedroom design from Family Home Plans would be perfect for a couple. The front door opens into a small foyer with a coat closet; this space can also be accessed from a door in the garage on the left. The living room is off to the right, and it features a lovely curved window. 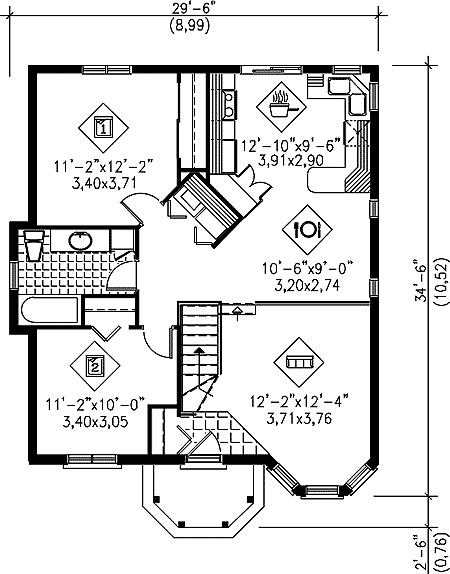 The kitchen and dining room are in the back right corner of the home, and a bathroom with both a tub and a shower is in the center. The back left corner of the home is taken up by the master bedroom, which boasts a large walk-in closet.